Events Highlights | Get Creative Medway | Creative adventures in Medway – find courses, spaces and groups. With the festive season coming up, here is a round up of workshops offering a chance to create something for a lovely Christmas gift. Workshop with Ruth Jarman. Learn how to quilt three layers and make a handy, over the shoulder bag or clutch purse/hand bag tidy with two zip pockets, two normal pockets plus other secret compartment holders. Small enough to wear at all times but roomy enough to keep your valuables safe when travelling or shopping on the high street. ‘Make & Lunch’ workshops. Learn how to make a range of gifts including a selection of candles, bath bombs, soaps, balms, pot pourri, room sprays and wardrobe sachets. Includes lunch and drinks at The Pomegranate Tree by the Chulo Naturals shop. A workshop offering an insight into the making of natural skin care products. Using natural minerals and oils you will learn to create and take away olive oil salt scrub, coconut & shea butter scrub and coconut & shea butter balm. Held in small friendly groups of 4 ensures a fully interactive learning experience. Create your own skin loving products with a personal twist to suit yourself, with handout leaflets to take away for further home production should you choose. Mandy Munroe brings her patchwork class to this beautiful treasure trove of a sewing and haberdashery shop. Create an adorable keepsake bear from old clothing with special memories in this two part evening course. 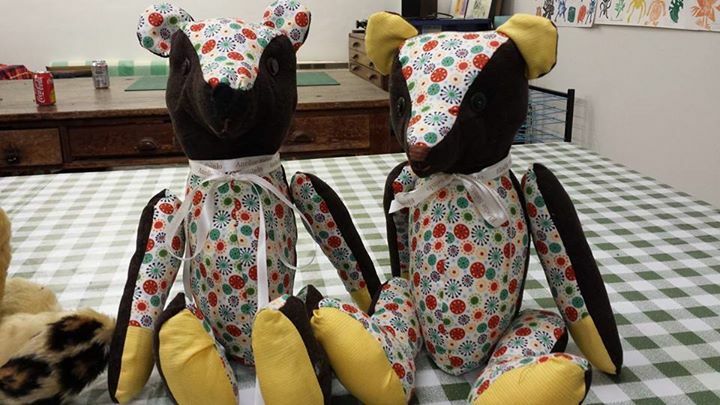 Mandy Adams will show just how to turn your special clothing into a gorgeous teddy bear or bendy bunny that you can pass on through the generations, keeping your special memory alive. Part one will take you through the process of laying out and cutting templates, preparing and understanding a sewing machine and how to use it. In part two you will go through the final process of stuffing, finishing off and embroidering the bears face. Mix & match a selection of designs to hand print Christmas cards for your most special friends and relatives. Choose between reindeer, robins, snowmen, snowflakes, holly, mistletoe, festive bells, xmas trees, candles and baubles, or print them all. Print up to a dozen cards per session, and embellish with stickers and sparkles. Learn how to print your own artworks with techniques including etching, photopolymer, screen printing or linocut. Classes are run by experienced artists and after taking a course you are eligible to use the open access sessions in the print studio. Learn festive sugarcraft skills on a two week course. Make a traditional Christmas door wreath. Make and decorate a snow globe. Family workshop to accompany the ‘Disquiet Beauty’ exhibition. Join artist Rosie Melville at the gallery for a mini gallery tour followed by a feather and found object sculptural jewellery making workshop, just along the road at the Guildhall Museum. Create brooches, necklaces and pictures from recycled textiles in a family workshop with award winning artist Jenni Burrows. Browse the Bespoke Market while you’re there. 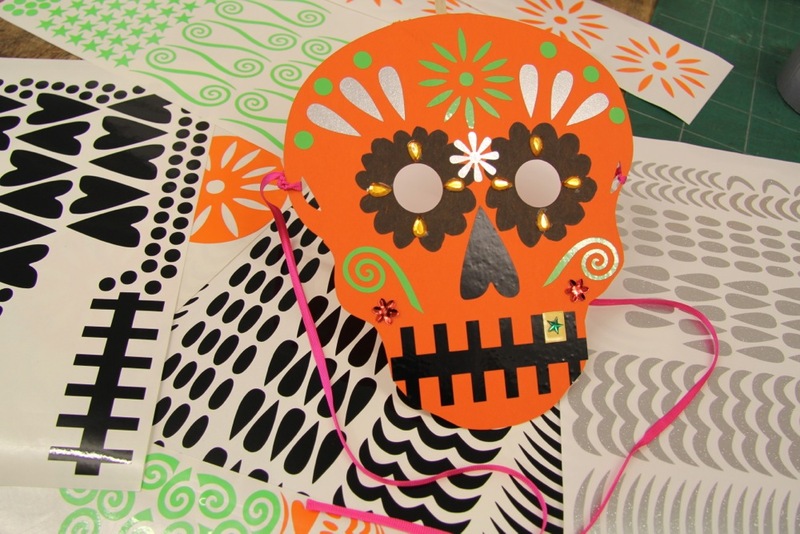 Prepare your house for the visiting spooks by making fun decorations with card, paper, vinyl stickers, recycled materials, printmaking and your imagination. Cats, bats, jack-o-lanterns, owls, bones and ghouls! Get ready to trick or treat by making a Halloween mask decorated with vinyl stickers custom made on our digital cutter, plus sparkles, card shapes, ribbons and drawings. Several spooky shapes to choose from. Family day with activities for all ages, celebrating Día de los Muertos. In Mexico, colourful decorations are strung about the streets and shrines with marigold flowers, candles, memorabilia and sugar skulls are built to commemorate loved ones who have died. Coming the day after Halloween, there’s a bit of a cross over with jack-o-lantern imagery, spooky masks and skulls, but this is a celebration focused on gatherings of family and friends rather than mischief and trick or treat. Decorate our windows with a vinyl sticker collage. Free. Make a shrine decoration for a lost loved one. Free. 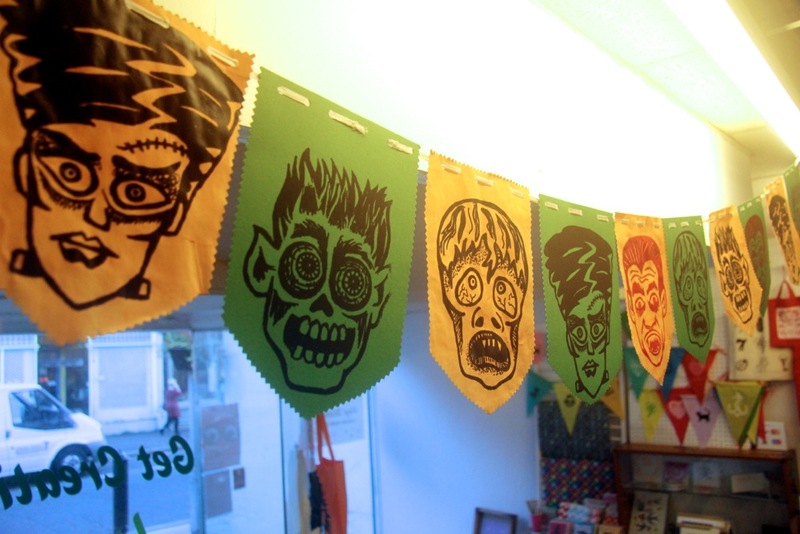 Make papel picado cut-out banners from recycled materials. £1 per person. 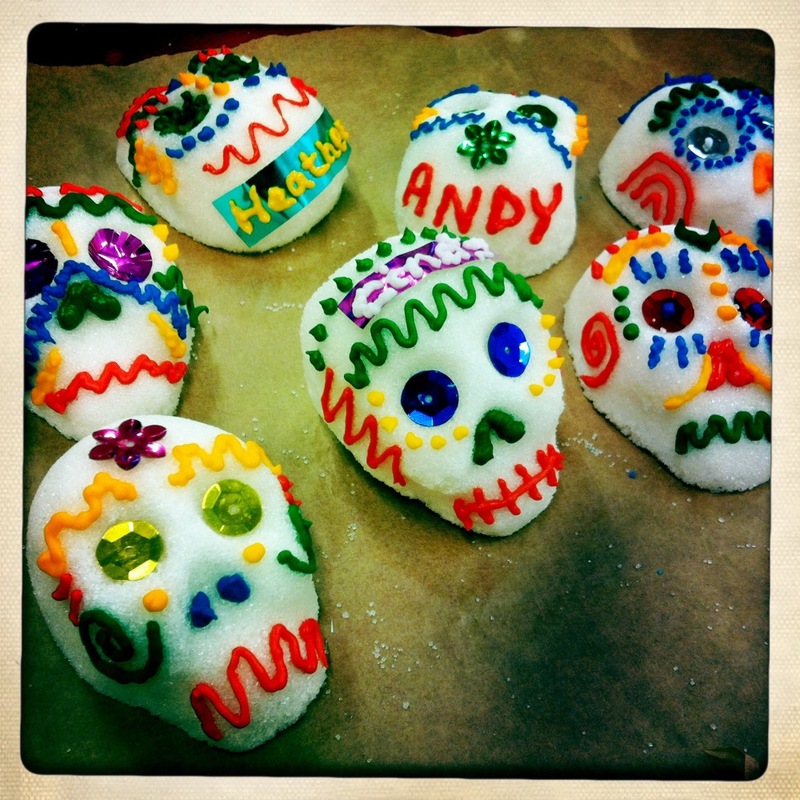 Decorate a sugar skull. £3 per person. Face painting. £3 per person. Make Dia De Los Muertos jewellery. £5. Screen print a tote bag with Dia De Los Muertos designs. £5 small / £8 large.